Looking for help with your Alien Mod or just need guidance on how to operate it, then check out this complete and detailed guide to the SMOK Alien Mod. The Alien Mod has become one of the most popular mods of 2016, taking home 1st place in the Best Regulated Mod category on GuideToVaping’s Best of 2016 event. The reason why this particular mod has gained so much success is because of its appealing design, its large vertically stacked OLED display, its perfectly placed and very clicky fire button, its small stature, its dual battery configuration, its 200 watts of power, and who could forget the other features like temperature control and its optional output modes. There’s no doubt that the SMOK Alien Vape Mod is a beast of a device, but not everyone who purchases the SMOK Alien Kit knows how to operate it correctly. In fact, if you’re like a lot of us men, you’ve already tossed the instruction manual in the trash immediately after you ripped into its packaging. We don’t want you to worry though, because we’re going to list how to operate this mod, its features, and its specifications so that you know everything about it! If this guide has helped you in any way, please share it with your friends online — we’ll appreciate it! 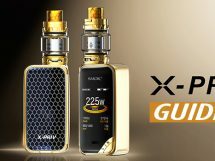 If you like this guide, feel free to check our our complete guide to the SMOK GX350, our complete guide to the SMOK G-Priv, our guide to the SMOK X-Priv Mod, and our complete guide to the SMOK OSUB Plus Kit. One of our latest is the complete guide to the SMOK T-Priv Mod. We recently wrote about the SMOK Alien Mod in our top 5 best SMOK vape mods post. If you have the spare time, check it out along with the other SMOK mods. There are 5 pages in this guide, please visit each page to learn everything about the SMOK Alien 220W TC Mod. The Alien Mod manufactured by SMOK (Shenzhen IVPS Technology Co., Ltd) is constructed out of a premium Zinc Alloy. It offers an incredibly detailed design that boasts high appeal and a comfortable feel. Everything on the device is perfectly placed, such as the ergonomically placed adjustment buttons, its stealth firing mechanism, and its hinged battery cap that completely seals the 2-bay battery compartment. Though the SMOK Alien holds two 18650 batteries, the device leaves a rather small footprint, being only 85mm tall, 44mm wide, and just 30mm in depth. Even with its small stature, this feature packed beauty delivers a wattage output range between 6 and 220 watts. Along with high power, it also incorporates temperature control (TC) — a mode that has become standard into today’s vape mods. This TC feature allows a user to range from 200 to 600 degrees and supports a handful of different coil materials, such as Ni200 Nickel, Titanium, and Stainless Steel. In addition, using the TC feature will allow you to fire coils as low as 0.06Ω, eliminating any potential limitations due to resistance levels. One of the most fantastic parts to the highly popular SMOK Alien Kit is its OLED display screen. The display is vertically stacked and offers more detailed vaping data than nearly any other device on the vaping market. The screen is clear and precise, and offers an entirely new operation interface. With this screen, expect to see the current wattage, voltage, a display of what mode you’re in (WATT), its working effect, dual battery life indicators, resistance value, working current, working temperature (the temperature of the device itself), and your current puff count while in its variable wattage mode. However, the screen changes just a bit when you’re in its temp control mode. When in this TC mode, expect the screen to show the working temperature (ranges from 200-600 degrees), the working voltage, what mode you’re in (TEMP), the coil type (Ni, Ti, SS), dual battery life indicators, the resistance value, working current, working wattage (wattage you’re at in TC mode), and your current puff count. The last thing you need to know about the Alien Mod by SMOK is that it has a series connection, a micro-USB port that is used for future firmware upgrades plus charging, and that the device is available in several different color options, including Silver, Gunmetal, Champagne Gold, Orange, Blue, Red, Purple, Green, White Red, Acid Blue, and Superman (Blue/Red). If you are someone that owns the infamous SMOK Alien Mod, we encourage you to explore this highly charged SMOK Alien Guide, which delivers an extraordinary amount of information about the mod and how it functions. Blake is the owner and creator of the Guide To Vaping blog. He has expressed his passion for the vaping industry through his deeply rooted and highly informative content. Being a writer and content provider for the vaping industry for year's, Blake has also gained experience from working with multiple blogs and well respected companies. Just received the Smok Alien 220w in Rainbow and am impressed with the quality and appearance. It feels really good in hand not being to big or small. Read the complete article but didn’t see what any recommended setting adjustments for using the preinstalled coil or the extra. Also ordered some new Ohmash 30a 18650 flat tops. My VTC5 18650 might be fakes and I don’t want to take any chances. Hope to get a lot of use out of this and help my wife kick the habit of smoking. Thanks for the Operating Instructions in a viewable print. Some of us can’t read the tiny print in the user’s manual. You made life much easier. I am now enjoying my Smoktech Alien 220w. Screen stopped Illininating after upgred. Is there away to make it work again? 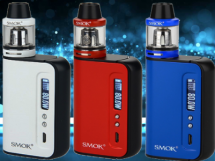 Your best bet is to contact SMOK support or the store you purchased it from. I believe once this happens, there isn’t much you could do other than replacing it. It should let you continue your draw for more than 2 seconds. There is a protection feature that’s built-in, which cuts off the draw when you reach 12 seconds I believe. I honestly have never heard of that issue. I would contact the store you purchased it from or reach out to the SMOK support. Unscrew your tank and screw it back on. When it asks if it’s a new coil click on yes, it will readjust. I had the same issue out of the box. I just bought my alien mod and i bought the baby beast tank with a .15 ohm coil and it tastes really burnt at 75-80 watts. i know some people vape at 150 watts on it. i’m not really sure what’s going on with it. Believe it or not, but I’ve heard this from several people. The issue is the cotton wicking in these coils, or more specifically the ones with more than 1 coil in them. Find a single coil for the TFV8 Baby Beast and I imagine it will wick better. I personally use the TFV8 Big Baby Tank and it wicks perfectly with the Q2 Coil. You said you are using the.15 ohm coils but which one? There are 2 different ones. For the X4 (quad coils) are rated for 30-70 watts, with an ideal range of 40-60. These I use at 48 watts. I personally find this coil gives me better flavor and a little less clouds. For the T8 it’s rated 50-110 watts, with an ideal range of 60-80 watts. This I vape at 60 watts With this one, I find it gives better clouds but I feel it loses a little flavor. I do use a max VG ejuice all the time. In another blog post on this site it discusses on how to get longevity from your coils. The blogger said you should use the lower range so your coils don’t burn up to quickly. I took the advice and it’s worked out great. I’m a vapomanic and was a chain smoker. Old habits die hard…lol However, now I don’t go through coils every 2 days. Since my go to juices are desserts the coils gunk up faster. My coils now are lasting about 1 week I do find if I use a tank or two of a fruit in between the desserts, it lasts even longer. On the back of the box of 5 coils it gives you all the information. Also at the base of the coil, the range is etched in. If you want to vape at higher watts your going to have to build your own. I already owned a Big Baby Beast which came with a RBA, as well as, the installed coil and a spare pre-made coil. However, I don’t remember which ones they were. Hope this reply helps you. Every time the screen turns off, it stops charging…why? It should continue to charge. If it stops charging, then there’s something wrong with your device. Chances are, it’s still charging in the background. It seems as if this is an reoccurring issue with SMOK devices here lately. I advise that you contact SMOK or the store you’ve purchased the device from to see if you can return the unit for a properly working one. I haven’t seen or heard of any fixes for the issue just yet. Mine is doing the same thing, but I reset the puff counter and it is still doing it. Is there anything else I need to do? Change the puff limit I believe. I’m having same issue but it will only lock and unlock. Not allowing me to get to the puff counter to reset. Idk what to do. The device is not charging properly …. It shows charging but once taken off charger it goes dead right away…. Tried to reset it but nothing… Took out the batteries and still nothing …. My I watt increments went up by 10. I stead of.1 how do I change this back!? Hold the button instead of clicking it and the wattage will increase faster. Everything in the manual is here. very very bad quality and i don’t recommend it. about one months display is not working and if you don’t believe me you will search in internet it is a chronic problem. That means the resistance of the coil is too low. You will need to use a coil with a higher resistance or a device that is capable of supporting lower resistances. What device are you using? oh, I’m a dummy… the Alien. Yea, you’re using too low of a coil resistance. The screen on my alien isn’t functional. It vapes but the screen doesn’t turn on. Help please? I have my alien for 4 months now and nothing to complain. Maybe the fact that the bottom has no color on it anymore but that is a minor issue. Some liquids are not suited for high temperatures. If you use a liquid for the first time on your alien, start at 40 watts (or equal temperature) and step up in 5 Watt steps until you get the best results. Consider different liquid vendors if this is always an issue with all kind of different flavors. The mix might not be good or the flavor is of poor quality. Fruity flavors are always better on low temperature and strong flavors like chocolate and coffee can handle high temperatures pretty well. Anyways, alien rocks. Glad I purchased it. Great info and tips, Jeff! I’m sure someone will find your feedback very helpful! Blake! I appreciate the thoroughness of this article. Well done. I am relatively new to vaping and was wondering if you may be able to offer insight into whether or not I should explore the temperature mode. I am using the Baby Beast tank with the T8 coil and am not sure if adjusting the temperature is a good idea, or if I do adjust the temperature, what an appropriate wattage for the temperature mode would be. Also, if you could help me understand how to work the memory mode (or rather, give me a quick “for-dummies” approach to it) so that I can better operate my mod, I would be very appreciative. Thanks again for a very informative article, and I hope you can get back with me relatively soon. My smoke mod is broken how do I fix it? I just changed my coil to a .6 and am not getting a very good hit. It is sputering. Do you have any suggestions? The coil is possibly flooded. I have the Alien Baby AL85 for a month now. I got new coils and it says “low ohm” it says in the booklet that I need to change the atomizer. What exactly is that? I ordered a new tank to see if that will help. What I would like to know is will the new tank fix the low ohm problem? Or do I need a new mod? what is the temp setting supposed to be on this thing? Hi All, i recently purchased the SMOK ALIEN 220 starter kit and ever since i bought it the coils seem to only last 2 – 3 days. i have changed coils for usage with different watts 25 – 45 watts , 60 – 110 watts , i have used it with the tank it brought and have also purchased the Aspire Cleto tank as recommended by someone. still i am having the same problems and coils only lasting 2 – 3 days. i have also changed E Juices but coils do not seem to last longer. Any comments / help would be greatly appreciated. Thanks. Make sure you’re priming the coils good by soaking the cotton with e-liquid before you use it. I own an AL85 Smok Alien Baby Beast, & have been vaping since the beginning of summer. It was working fine & then I messed with the settings & now no matter what I do whenever I try to hit it at my regular wattage(55),I get a harsh taste or a harsh hit & very small clouds. I got new atomizers, new juice, even a new tank & I cannot get it back to where I was enjoying it. I just need to know what setting should my Volt,Ohms,Amps,PCB. etc… should be at ?? I have the AL85. It is saying its charging but it never takes a charg and when i go to hit it when its pluged in it says battery to low i even tred to let it charge. Any one got any ideas on what i should do? Hard reset: Turn your SMOK Alien upside down, then open the battery door while the batteries are still inserted into the device. Make sure the battery door stays up during this process. Now hold the two adjustment buttons down at the same time. While the two adjustment buttons are being held down, close the battery door. Once the battery door is shut while still holding the two adjustment buttons, the batteries will then supply power to the device. A prompt will appear on the screen for two seconds asking if you want to factory reset, choose YES. Let me know if that helps. I did this reset because it appears that my front buttons have quit working properly and the screen just looks like static. No visible words or anything. And its frozen there and won’t change. I think my mod is bricked. Unfortunately its a lil over 6 mis old now. Any tips? same thing happens to me. there is just a frozen static window and nothing happens unless i take out the batteries and re-insert them. but then it turns on like normal without the message asking if i want to reset it. i want to reset it because no matter what tank i put in there it always reads that the coil is 0.15 ohms, and i only use 0.4 or 0.6 ohm coils. Hello and and thanks for the informative guide. I purchased my Alien 220 about a month ago and have had no issues at this point. I started at 40w and increased from there every few days until I got to 60 watts. The flavor seemed slightly burnt if I went any higher, and I am using about 5 different brands of juice. It may be my juices tend to be sweet, but I prefer the wattage at about 45-50. Are there any benefits to vaping at a higher temperature? ohms will be set dependent on the coils resistance. The side of the coil will show the recommended wattage. Set the wattage within those numbers. thanks sir its showing about 0.4 ohms.. what about the watt and other things ? i just need a bit of flavour in a single puff not heavy, i already set it on soft mode.. how much i fill the tank with flavour full or half ? My atimiser burns out within a couple of days? Do I need to change the settings? Hello! Thank you for this wonderful guide! I am somewhat new to vaping. I just purchased the Smok Alien 220. I am curious what the voltage, ohms and amps should be set to? Does it depend on the coil or batteries? My previous mod (my first) was used and it didn’t have these settings. How do I know what coil type I have? I’m currently using SMOK V8 Baby-T6. I don’t see on the package if it is T-NI, T-TI or a T-SS. It’s a 0.2ohm sextuple coil with a range best from 70w to 90w. wire is Kanthal (use wattage mode). I used the Smok Alien 220w since two months back , it’s really amazing kit .recently I noticed that the taste mix with bad smil , I think the cotton become bads ,and its the the time to change the coils. i have two tanks , the original one which comes with kit and i have ordered for extra one ” SMOK TFV8 BIG Baby Beast Tank ” , but I found many OHMS resistance values and I don’t know which will be the best for me . could you please advice me to choose the cois for both Tanks. I’ve had my smok alien 220 for about 8months and had no problems, I updated the firmware as soon as I got it ,now in the setting mode it only goes into screen time, scr lock thats it no contrast, adj ohms, download ,etc. I’m running an smok rta g2 with 2 26guage kanthal 10 wraps at 64 watts it vapes perfectly. The only issue is it won’t allow me to access all the sub-menu options. Also what is the current firmware numbers? My numbers read V1.3.2 I believe they are the latest up to date, if not please let me know but I can’t update until I can access “download” in the settings. Curious and thanks ! My smok alien is saying a set of batteries with charge in them (tried them in another smok alien mod) are dead and can’t charge it through usb port (i know you shouldn’t anyway). I only bought the thing a few months ago and it was working fine up until the other day. Can anyone help?? 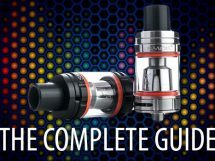 Thank you, this guide was very informative, I was given the Smok Alien without the instructions, so now with your help i have a better understanding of the Vape! Sometimes when i vape it will hurt my throat and make me cough, but sometimes i’ll use it and it will work great. I don’t understand because i’m using the same juice and sometimes it will make me cough and other times it won’t. I have a T-Priv, is there anyway to lock the wattage or temp control, to prevent the buttons from being accidently pressed? Simple The solution is to press the fire button so the screen comes on and then screw the tank off. Again press the fire button so the screen is on when you screw the tank back on again. So basically make sure that the screen is always on when you unscrew and rescrew the atomizer (RTA, RDA, RDTA) onto the Smok mod. That solves the Don’t Abuse Protects problem. Happy vaping! I’m new to this and I hv the Alien Smok I’m trying to figure out what are the best numbers to all the settings (ie, ohms, volts, amps, and temp) so I get the best flavor and a good amount of smoke. What I hv it set to works fine, but I want to know if it’s the best settings… I’m at 60.0 w. .000 volts. .144 ohms. .250 amps. 34c pcb. And I have it set at normal…..
GTFO – First I want to Thank you for your efforts regarding Smok vaporizers. Second I dropped my procolor and it stopped working. I replaced it with an alien. Then I saw your advice regarding a non working screen about slamming it down on something hard – I used something hard with a couple of cloth layers and SURPRISE it WORKED. Again, Thank You for your time and consideration. SMOK should pay you. Have a good one. BTW, I suggest taking out the batteries first. Since I knew how it dropped – bottom hit first (batteries were slightly indented on the bottom portions, hence the take the batteries out prior to slamming it down), I slammed it down hitting the top. Works fine now. Prior to that, lights would light up but would not light the screen or work. smok alien 220w mod is what I have, insert the batterys at the bottom ( close the lid) screen lights up and goes away as it should, but I push the fire button 5 times no power on.. had some problems with charging my mod not sure if it’s the fire button or the batterys are dead. if i insert a usb (charger) to it without batterys in I’m still getting power. insert batterys as it’s charging and push the fire button 5 times, nothing happens. help meee. Hi, how do I reset my SMOK ALIEN 220W TC. Any information for how to do so would be fantastic, also if you could do so by email it would be great, thank you . This is a very informative article. I just bought this mod about a month ago. The operations manual wasn’t nearly as detailed as you have laid out. Thanks for the tips on shortcuts while navigating through the screens. Also Smok didn’t explain in the manual on how to upgrade the firmware. I didn’t know that you had to hold the fire button during the process. Donna, I’m glad you found some use out of this guide. I knew the user manuals were lacking, so I first created one of these online manuals or ‘guides’ to better explain the product and what it’s capable of. It helped many people, I received a lot of responses, and it obviously drove a lot of traffic in return, so I’ve continued to write them for as many products as possible. I’m glad this one was able to help you. my alien wont let me go over .65 inhales how do I fix that. Any idea how to reset puffs or set the puff counter to never reach max when my left button is broken? Hello, I purchased a smoke alien and at the dams time I purchased a super tank. The store clerk sold me Aspire Triton replacement atomizers 0.4 (25 to 30 W). I go through a Atomizer about every 2 days. When I used the Pegasus mode I used the same atomizers as well as the same juices it would last maybe 2 to 3 weeks. My mode is set last 30.0 S 0.650 volt and 1.497 AMPS M3 Mode. I just read your users guide and I’m still more confused than ever. I really like to Mod size, but I hate going through so many Atomizers. Please advise I know I must be doing something incorrectly!!!!!! Thank you in advice for your time. Can You Vape Everyday and All Day? Subscribe to the Guide To Vaping Newsletter for the latest news, reviews, information, and our continuous list of deals on vaping products. Copyright © 2017. Guide To Vaping. A Brown Media Company.